The term 'Marae' is commonly used to collectively describe Māori owned and managed lands and buildings, however Māori sites are actually more complicated. The full name for the sacred courtyard in front of the meeting house is Te Maraenui-Atea-o-Tumatauenga (the larger marae of Tumatauenga, the Guardian of War), although the much shorter term Marae is usually used. Going on to the marae means entering into an encounter situation, where challenges are met and issues are debated. All newcomers to the marae must be greeted formally by the tangata whenua (hosts), whether in the warmth of a welcome, in the sadness of a tangihanga (funeral) or even verbal battle on mutual issues. It is the place where people formally come together on a specific occasion for a specific function. It has its own tikanga (customs), although this may vary from iwi to iwi (tribe to tribe). The marae and the meeting house are complementary and together serve as the focal point for community sentiment. The meeting house is normally the major central building and, in the main, ornately carved. 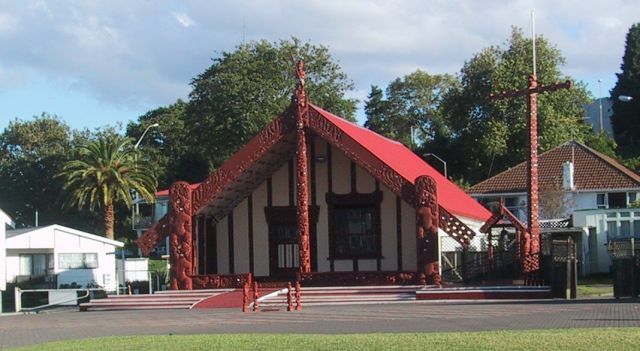 The meeting house may have many names, including whare tipuna and whare nui etc., and in nearly all cases it is not only named after an ancestor but it is structured to represent symbolically the ancestor. Thus the tekoteko (carved figure) on the roof top in the front represents the ancestor's head, the carved angles from the head down towards the ground (maihi) represent the arms, the ridge pole to the carved figures around the walls (poupou) represent the ribs. The poupou are normally carved ancestors representing other tribes. Poupou then promote a feeling of belonging. 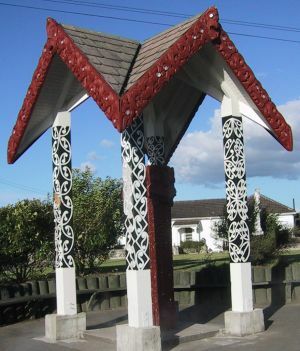 The uprights, normally two holding up the tahuhu, represent connection between Ranginui the sky father and Papatuanuku the earth mother. While there are other interpretations it follows appropriately that meeting houses are named after an ancestor. Thus, on entering the house it can be seen as entering into the bosom of the ancestor. It follows also the interaction between people on Te Maraenui Atea-o-Tumatauenga can be and should be significantly different from the type of interaction which is normally encouraged inside the house. It is believed that inside the house the Guardian of Peace (Rongomatane) reigns and it is in this atmosphere and under this belief that people are required to interact with one another. The Meeting house traditionally faces east, to see the first rays of the sun as each day dawns. In many tangihanga (funerals) the body lies in state, within the bosom of the ancestor, or under the protection of the ancestor to witness the fullness of last days on earth. As the name implies, this is the eating house, the place where the "inner being" is satisfied. The whare kai is a separate building, not necessarily as a physical reality but in some cases as a concept or belief. The concept of tapu (sacredness) prescribes where food is eaten, where it cannot be eaten, and also where drinks can and cannot be drunk. To the Māori, food is a common element (noa). Whereas the whare tipuna (meeting house) is tapu (sacrosanct) and food cannot therefore be eaten there, the whare kai is free from tapu - the two are at opposite ends of a continuum. Many marae have a urupa (graveside) nearby, acknowledging the ancestors as a living dimension of life. 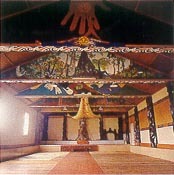 An ancestor is commemorated within a building - respects are paid to those who have passed on to the hono-i-wairua (gathering place of spirits) within a whaikorero (formal speech making) reflecting the belief in the merging of life and death that is significant and meaningful for the Māori. People living (te hunga ora) are the result of a combination of the dead (te hunga mate) and the living (te hunga ora). References to these concepts are very frequent in whaikorero. On some marae memorials to a significant ancestor or people who died in the second world war are found to the side of the marae or whare nui and in some cases a flag pole stands majestically at the side of the meeting house. Last, but not least, the ablution block and toilets are placed significantly to the rear of the whare nui and the whare kai.